Should the U.S. military go into Ukraine? Kiev, Ukraine (CNN) - U.S. President Barack Obama threatened Russia on Friday with new sanctions over its actions in Ukraine as the Ukrainian Prime Minister also came out with tough words against Moscow. Russian attempts to start conflict in Ukraine will lead to military conflict in Europe, Prime Minister Arseniy Yatsenyuk warned. He also charged Russia with aiming to occupy his country "militarily and politically," and said Moscow wants to start a third world war. His strong statement came amid a sharp escalation in tensions. Russia's defense chief ordered new military drills Thursday near the border with eastern Ukraine after Ukrainian forces said they killed five pro-Russian militants in an operation to clear roadblocks near the city of Slavyansk. 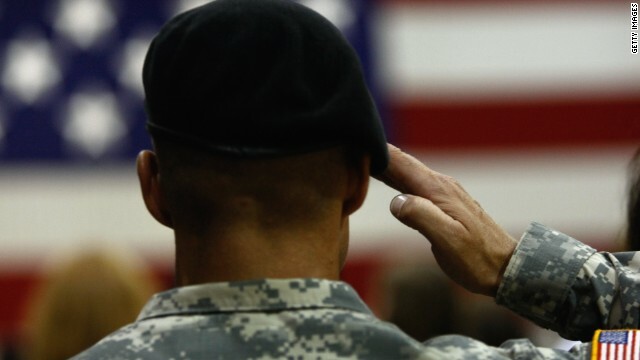 We want you to weigh in: Do you think the U.S. military should go into Ukraine? We should give some thought, to let other countries solve their own problems for some years, since we have become part of the perception problem. Today, countries that are about par, in living standards, find us intrusive, when we get involved. Backing off for a time, will allow us to solve our own fiscal problems. At the same time, others will notice our absence, and will probably learn to appreciate some of our interventions. Let them see if China and Russia will fill the "aid" space we leave behind. Our war hawks? Well, we could arm ourselves to the teeth, it is cheaper than roaming around in Afghanistan and Iraq, rebuilding what we destroyed. Let's take a break. Let's solve our own problems, an area where we seem to be having a hard time achieving because of political tribalism. Let's stay home for a while. The Ukraine and Russia: We need to stay the heck out of this – This is none of our business! If our leaders really want to do something Bold and Brave, how about they start standing up for the American People who they're supposed to represent, By Standing Up to the WTO and Stop Selling Us Out to Other Countries like Communist China. This is the Crimean's, Ukrainian's and Russian's business not ours. If the Crimean section of the Ukraine wants to go back to being part of Russia, that's their own business. And if 95% of the Crimean people voted for this, it's certainly not our place to say that they can't. Let's say for instance, if Texas had seceded from the United States of America 10 or 20 years ago and then after Texas's new government fell apart, a section of Texas wanted to go back to being part of the USA. Would that be any of Russia's business? – No, of course not. So, we shouldn't be making any threats or ultimatums to Russia or the Crimeans, because it's none of our business in the first place. Stupid unnecessary idol threats just make us look lame and weak. Bring our troops home from the mindless Middle East and deploy them on our southern border. There is no reason that our American men and women should be sent over there to risk their lives for another one of those totally messed up countries. And How About Hiring some of our Unemployed Veterans as Additional Border Patrol Officers, ICE and INS agents? So, for all those who say "no", is your response the same if Putin "annexes" Eastern Ukraine? How about Mid-Ukraine? Answer still "no"? ok, now he presses onto Kiev and takes the entire country as his own? Concerned yet? Still "no"? The Balkans.....then maybe Poland? Still "no"? No one wants war, but unfortunately, there happens to be times when madmen have to be stopped. Hitler was allowed to do what he did, because of the same feelings that were present then. It didn't save the world from eventually having to deal with him, at the expense of 50 million dead. Stopping him early might have avoided that kind of carnage, or even better taught him that it would be unwise to continue his quest. That's what is hoped for with Putin; not that we want a war, but that he would understand that we will oppose his "annexing" of territory that doesn't belong to him. We need to increase economic punishments for Russia exponentially if they continue to annex Ukranian land. We can (and will) make them an economic pariah in the world community if they continue. But at no point do we commit military to fighting Russia over the Ukraine. They aren't our ally. We disagree with the principle of Russian expansionism, but we should not lose American lives over it. Poland is a member of Nato. If Russia were to move against any Nato ally, we absolutely need to use military force to stop them. Russia is going to lose this in the end. Not because of anything to do with the military, but because of the economics. They need their energy sales to western Europe for their economy to function... and that's going to go away if they don't find a way out of this Ukraine mess. Gaining the Ukraine at the expense of destroying their economy and becoming a pariah to the world community is not going to be a winning exchange for Russia. They're shooting themselves in the foot. For all of you who have said yes to US troops in Ukraine have a death wish that I do not share, and I'm sure that millions of Americans and the entire human species doesn't either. The moment a US or NATO soldier steps foot in Ukraine, Russian will invade the east part of Ukraine within hours, they will not allow us to take it into NATO, or haven't you noticed with Crimea. Don't attempt to call Russia's bluff; RUSSANS DONT BLUFF. Have you not noticed when Russian fighter jets circled our destroyer. That's why we haven't done anything militarily against them. Neither the US or RUSSIA want to appear weak in front of the whole world. For example, if the state of Texas decided it wanted to become independent from the US and some how it happened; and Russia offered Texas membership into the Russian Federation; what do you think the US response would be? It would be the same response Russia is doing know with the Ukraine. The US would annex the Port of Houston and/or the Gulf of Mexico. It is the same scenario. Any direct contact between the US/NATO troops against Russian troops will end in the destruction of all life on Earth because of the stupidity of politicians on both sides. If either military (US/Russian) begins to lose ground in the heat of battle (GOD forbid), they will launch every weapon in their arsenal; Chemical, Biological, Unknown Weaponry, and the most horrifying of all....NUCLEAR WEAPONS. And dont you think for one nanosecond the Russians or the US won't use them!!!! Good luck to you all. Its an absolute correct assessment, if it wasnt the US or NATO would have militarily intervened a long time ago. It doesnt matter who has the best tanks or ships or firepower. We both know it will never come to conventional warfare, it will go Nuclear in a second. Lots of people seem to think it will be a soldier against soldier or tank against tank, no way in hell. There's this belief that, "awe Russia aint nothing we can take them anytime, all their military equipment is outdated and no good," thats not true at all. The S-300 surface to air makes our Patriot missiles look like bottle rockets, not to mention the S-400 and the S-500. We have the Stealth Raptor which is the baddest fighter in the world, the Russians have the SU-50 which matched our raptor and is far more durable. You got to understand that everytime we make something better than the Russians they counter by matching or making something better. Russia can't handle both the US and NATO forces combined, they cant. And the Russians know they cant. Thats why it will go Nuclear, the US and NATO know this as well and do not want to take that chance. Again that is why there is no military intervention, and there will never be. Dont look at the technical, we know the Russian military is behind in some aspects of equipment and ahead in others. They will never station troops in Ukraine; again if they did then Russia would roll right in and takeover the eastern part of Ukraine to try and keep it as a buffer, its the excuse they are looking for. Russian troops are not on their border for looks, they are ready for action. The point is that the Ukraine is a buffer between NATO and the Russian Federation, they do not want to lose that buffer. Dont look at this from a geo-political perspective, its not geo-political, it may have been at the beginning but know its evolved into something far more dangerous. I would say that republican thinking would send troops to Ukraine and force a situation that would cause Russia to respond with military action; AND IT WONT BE CONVENTIONAL. I'm not republican or democrat but its safe to say that if McCain and Palin made the presidential election, you and I would'nt be here typing this out and the planet would be a smoldering radioactive cinder for the next 5000-10000 years! They wont invade NATO admitted former soviet blocs because Russia would go down in the history books as starting WW3, (if there is anyone left to record it), as instigating the destruction of the mankind not to mention everything else. Remember, the US is the first country to use nukes in war and the Russians know this and will be no hesitation on their part. Good luck AJ. The US Army is not our Army. If you ever met the higher ranks you would see that these guys don't really give a damn about the United States. The US Army has some of the country's worst criminals. Eventhough the tax payers are paying for the military payroll, the military really doesn't give a damn about all of it's US citizens. That's the truth. General Petraeus is Putin. General Swarzkorff is Gorbachev. I know for a fact General Petraues has over 100 houses in the United States and he didn't pay for one. The last thing America needs is another war to drain public funds and to take blood of our citizens. We are in an economic collapse and our own country is falling apart, and we're supposed to fight for Ukraine? The war machine knows there is profit in this, and both parties are taking orders from them. There's been lots of arguments for Ukraine that could prove wrong, and there's already been lies from the supporters. With so many wars and so much blood, let's take ourselves of our alcoholic addiction to war. The last thing we want to do is play with American's lives by risking provocation of others, especially Russia. Enough people have died for these wars. Enough is enough. Because of the costs, the burden of proof is on the support. Yeah! That's right, we must avoid any regional conflicts at any cost! Appeasement certainly doesn't allow regional bullies intent on annexing their neighbors to consolidate forces and gain confidence that the national community will allow their aggression to procede unchecked! That TOTALLY doesn't ultimately lead to much larger-scale conflicts that could have been prevented through the application of force early on to remind expansionists that attempted annexation through force be resisted by force! Trust me, I know! -Signed, Neville Chamberlain. No reason to send any troops there, bi den and the ketchup dude fixed it all... Didnt they ? If you want our country to stay super power for the next generation you all need to act tough and stop complaining about everything, troops chooses to be in the army to depend that's they're job and that's what they're there for, and they are sure well know it, they're not for decoration. In terms of problem in the country work and stop depending every single thing in the government. Your life is your responsibility. Sooner or later if you all don't act like our ancestors did this country will be in the mercy of Russia and China. Absolutely no. Our USA government needs to mind the business of our own country, that already has enough issues and ongoing problems that can't be solved. We don't need to spend more $$$'s on wars and put our military troops lives at risk when it's not necessary. Right, because isolationism worked so well in the first two world wars, especially the second one. Gee, what a winning strategy! Apparently, the ones that are saying no didn't pass your WWI & WWII history test. Also none of you are watching what is going on. If we don't do something now to PREVENT Putin from taking Ukraine, we will be looking at WW3 in a blink of an eye. US is the only remaining Superpower (well if you combine EU, their militaries are powerful than Russia) I'm tired of hearing diplomacy and red lines. Putin has shown that is not going to stop him. US has been a global protectant since the Spanish American War. So I say yes. Wars has always been in motion and some are made to prevent a madman from killing innocent blood. Now I am looking at Obama and he would look weak if he keeps talking red lines and no action. Show the world we mean business and stop Putin because he is NOT going to stop at Ukraine. He want the old Russia back and if allowed to, he is going into new NATO members like Poland and the Baltics. Why do you think US troops are deploying? Behind the scenes, they know something is up and not going to tell the whole story. Stop believing everything on TV and pay attention. We are going to WW3 rather you like or not! We will always be in a conflict so stop crying about. It's the American way. Lewis is psychotic it doesn't matter if NATO has i billion men and russia has 4 one nuclear bomb is all it takes to end the world russia knows it can't win a war but the usa know it can't win also THE NUCLEAR FACTOR. There have been thousands of nuclear devices exploded on the earth. How will one more end it? I wonder why your country is so interested in the situation in the region located so far from you. Half Russians have Ukrainian relatives, half Ukrainians have Russian relatives, we understand each others' languages, we have common history. Do you really understand what is going on in the region? Who tells you that Putin and Russians want old Russia or the USSR back? It's nonsense! Russia has changed a lot and nobody wants Soviet Union back. Though, there were a lot of bright pages in our soviet history we are proud of. As well as we are proud of our composers, writers, artists, scientists... Don't be so arrogant thinking that your American opinion from so far away country is the only right. Half of Eastern Ukraine's population is ethnically Russian only because the Russians forcibly occupied Ukraine in the 1930s and massacred the ethnic Ukrainians to make room for resettlement. I guess the Mongolian Golden Horde should be given back their rightful inheritance from the Pacific to Poland, too, huh? P.S. And who told you that Putin(=Russia) wants to take the Ukraine?! NO!! Stop feeding the War machine CNN!! Look what these wars have done to our military!! We support our troops at home where they belong!! They've been exploited by the elitist politicians for long enough! So I am hearing a little Yes and more No's, so back home some are saying that the President is looking weak so for those of you No's out there do you consider the President's actions.. wanting sanctions, as weak? Many GOP critics who talk about him looking weak give his EXACT actions as to how we should respond (though some want us just to do it ourselves rather then consult with Europe and time the sanctions). Ukraine is not a member of Nato. We can condemn what Russia is doing, and we should institute sanctions to make the condemnation have teeth. But we should not go to war over a country we have no defense pact with and no real national interest in defending. We absolutely should be moving some assets into the area though... as Poland is a member of NATO. Obama should unzip & draw a yellow line in the snow. Should we send troops into Ukraine? The answer is no, but the real question is will Russia force us to? That has yet to be seen. If Russia takes half or more of Ukraine we will be forced to send troops to protect Poland, Hungary and the rest of teh Eastern Block countries now part of NATO. Sorry all...but are you nuts? Too many pacifists in the US now. They say that Ukraine is not in our interests? Then what is? In order to stop Putin and his still idealistic communist ways one needs to stand up to him before he will back off. One can not condemn the Russia people..however we can the government. Yes..I feel that NATO and the US should put forces..not directly into Ukraine at the moment...but completely surround it..WITH SHOW OF FORCE!!! No one truly realizes what the general population feels or thinks. I was there last fall during the uprisings. Very intelligent and polite people who want just as we all do ..FREEDOM! Russia has obviously already infiltrated the general population to start these uprisings in the east...just for an excuse .."to protect Russian ethnics"..lol. Both Russian and Ukraine ethnics there wish nothing to do with Russia and Putin. The US goes to every where else to assist others for lessor reasons. For once let us unite in America to finally be able to stop REAL oppression!!! You're using that buzzword, "freedom" Until Russia attacks any of our NATO allies, I want us to stay the hell out. Let diplomacy work for once. You're suggessting we risk our sons and daughters to engage a country that hasn't attacked us yet. We need to stay out, untill we really have good reason for. You don't beat a bully by meekly handing over your lunch money, you do it by letting it be known that if he tries to take it, it will COST HIM. I't nice to see the 'arm-chair quarterbacks' talk about sending military troops in to harms way. This generation has a false sense of superiority, after fighting a few pseudo wars with goat hearders, who lacked airforces and proper equipment. The American public has a cow every time a couple dozen boys are flown home in coffins . We have lost just over 6800 American live in Iraq and Afghanistan. I can't imagine the response when we see that many lost in a week, or a day, fighitng against an actual opponent. Russia is ranked at the top , alongside the US, China and India as one of the top four military powers. These off-handed idealists who are so willing to throw our young men and women in to a conflict, that we and others created in the first place, are going to quickly learn to understand why their grandfathers and fathers have those long solemn stares when questioned about their experiences in Korea and WW2. Not if you have weak leadership in Washington. Um, sorry, I spoke too soon. Any Leadership would be an improvement of what we have now. A President should not threaten someone. They should do it and then tell the Nation what they have done. @Loren "Enslavement"? What a propagandistic nonsense. There were no Russians in the governments of those countries, and there was huge support for socialism system in there. Socialist movements were actually very strong in West Germany, France and Italy - until they were cracked down by USA's occupational forces. Ummm... your history is a bit messed up. In 1945, 80% of poland's officer cadre were Soviets (members of the USSR). The president (and after becoming communist, first prime minister) of Poland was a NKVD agent (Bolesław Bierut). After becoming openly communist the Polish defense minister was a Soviet soldier (Konstantin Rokossovsky). After holding polish political office from 1949-1956 (which he stepped down from the Red Army to do) and crushing multiple independence movements in Poland he retired... and went back into the Red Army where he served for 6 more years under the Soviet Union. The idea that no Soviets were in control of the polish government is simply ignorant. They had actual members of Soviet organizations such as the Red Army and NKVD throughout the polish government at the time it was formed. They had nearly complete control of Polish military (through Red Army officers). And they used military and governmental power to use force to crush any movements that the USSR didn't support. And the same pattern is there in the other former Warsaw Pact nations. This pro russian propoganda simply won't work the way you're trying to do it. You aren't even attempting to be subtle in your manipulation. It simply doesn't work in this environment. Right. The Russians TOTALLY don't have a history of nonconsensual occupation of sovereign nations. The Hungarians just started a revolt in '56 because they were bored? There were a series a revolts in Soviet-occupied nations throughout the 50's and 60's; the population didn't really want the Russians there. It's just kind of hard to kick the Russians out when they have dozens of tank divisions camped out in one's country. Crimea is lost. The Ukraine will also be lost as soon as the Russians close the valves to the natural gas and oil to Germany, who will say that it is not worth the trouble and harm that it will do to their economy and employment rates. Too little too late to worry about the outcome. Sudatenland all over again. Red lines drawn on muddy waters. Another great accomplishment for this Administration, like Lybia, Syria, Palestine, Benghazi, China, and antagonizing Israel. Great going. Metternich should be celebrating in his grave of the accomplishments of great diplomacy.
" Sudatenland all over again." - upside-down propaganda, because Hitler-lovers are in Ukraine's illegal junta, where neo-Nazi control security, army and general attorney offices. Nothing like that has happened in Chekhoslovakia. By the way, Russia has legal right to act against junta and protect citizens of Ukraine against them being subjugated to junta's illegal power - according to official request from legal president of Ukraine Yanukovich (who was never impeached: not enough votes and no obligatory Constitutional Court hearings because junta cracked down against the Court). Of course, mainstream media reports nothing on that, because the goal is to BRAINWASH readers/viewers into Department of State talking points. Not unlike how 70% of Americans were brainwashed into believing that Saddam was responsible for 9/11 and had WMD. That is just an incorrect characterization. Fascism is simply an authoritarian state with extremly nationalist or ethnic basis for the authority. It also tends to support the idea that stronger nations have the right to expand their territory and displace weaker nations. For example, a fascist state might invade a neighbor and annex it because those of the same ethnicity live there. That's what Hitler did with the Sudetenland. And that's what Putin did with Crimea. There is only one country in the area acting fascist... and it's not the Ukraine. Throwing "Nazi" and "Fascist" around as buzzwords by Putin is so frustrating because his government IS Fascist by the textbook definition. Even his justifications (protecting ethnic Russians) are Fascist. His domestic policies follow similar patterns... getting people to support restrictive and violent action against portions of the population as a way to unify the rest of the nation behind his rule (going after homosexuals and anyone targeting the predominant russian church). This is mid-1900 political philosophy that Putin is trying to use again today. We saw elements of that in the US (Macarthyism for example). But it simply doesn't work with the way the world communicates today. Your statements defending Russia come across as stupid... because we have more information. We know your statements are completely unsupported by fact because WE CAN SEE WHAT RUSSIA IS DOING. The US is not going to fight a war on behalf of the Ukraine. We aren't allied with them and have virtually no economic interests with them. Will we sanction Russia? Yep. Will we sell Ukraine natural gas on the cheap? Yep (let's not forget the leading producer of Natural Gas is the USA now... not Russia). We are going to completely ruin the economic influence Russia had by fracking the heck out of our country and selling the gas and oil to europe. And we're only going to do it because Putin is a fascist with no long term thinking. I HATE the fact that we'll be hurting our environment simply to harm Russia's economic interest... but anyone can see it happening. In fact... anyone can see that's WHY we've been ramping up fracking as much as we have. Because Russia can't advance to the 21st century and wants to use 20th century politics. And because of that... Russia will suffer. And it all comes back to Putin. I believe that the phrase is "Not, just No, but Hell No!" No, no, no, no, no, no........just in-case I was not clear, No. Please, You are Welcome – to Hell! The USA should step aside but still be in tune in what's going on the other side of the world,but if our allies really need us than the USA is there too help. "but once again that's only my own personal opion." Your liberal buddies should be proud of your continued copy/pasting of pure hate, which exemplify the typical left extremists rant. You voted for Palin didn't you. Read the Ryan Budget to see how the GOP feel about the Old, Sick, and Poor people. April 25, 2014 at 9:38 am |"
Just because it's copy and paste doesn't make it any less true. You must be a proud GOPer. Hating all the Old, Sick, and Poor people and brainwashed by the GOP to vote against your own interests. Remember, you will be Old, Sick, and Poor some day. Copy and Paste doesn't make it any less true. I hope you are proud to be a GOPer who hates the Old, Sick, and Poor people. Remember you will be Old, Sick, and Poor (most likely are already) some day. How do your parents like their SS and Medicare? the US should not send military forces into Ukraine. we don't need another Vietnam/Iraq/Afghanistan. It is not a viable option. According to Obama's economic "plan", all of our foreign based military personnel must come home and be laid of and our military so reduced. Half the money saved is to be invested in infrastructure and the other half is suppose to be enough for the federal government to start posting surpluses starting in 2015. The President is already more than a year late with the budget cuts that are suppose to go along with the tax hike on the rich as part of the President's balanced approach to deficit reduction. We are also waiting for the budget cuts that are suppose to go along with the ACA taxes. To achieve his economic goals, besides bringing all the troops home and laying them off, more tax hikes and matching budget cuts will be required. Will have you seen this? Post too complicated to help you. Just call your Nanny for directions. Maybe your Nanny still have answers. So Gundy wants to start yet another "unfunded/offthebooks" war with Russia. A war that cannot be won by either side. Take Palin with you.....please.